Quickly, Charlie started reading some of the labels alongside the buttons. 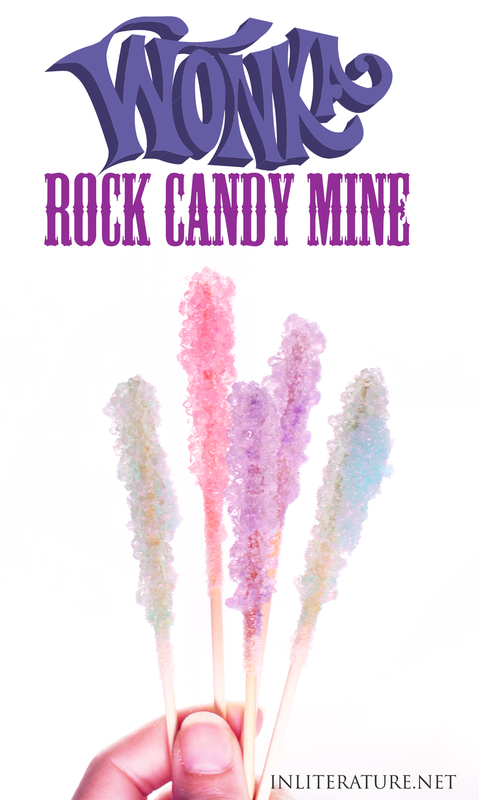 THE ROCK-CANDY MINE 10, 000 FEET DEEP, it said on one. A bright underground cave, shimmering with pinks, purples, blues and turquoise. I can only imagine how mystical it would be, being in Wonka’s Rock Candy Mines, but here is where my imagination took me. In one type of rock candy mine, I’m picturing Oompa Loompas like the Seven Dwarves chipping away at rock candy stalactites and stalagmites, tossing chunks of rock candy into their little carts to be hauled off. Need help entering my mind? The otherworldliness of Reed Flute Cave in China helps paint the picture. But imagine it all candy…. Alternatively, the rock candy mine would be a large scale version of this project we’re making today. This Wonka cave would need to be filled with still sugar water, near the ceiling of the cave. Oompa Loompas, decked out in snorkelling gear, would place sticks into the cave roof. With these sticks partially submerged in the sugar water, they’d be left for a week or two before removing them, with hardened candy crystallised on the end. Don’t have an underground cave in a chocolate factory? That’s ok! We have a recipe right here for you. In 4 water glasses, drop in some food flavouring (the amounts you’ll have to decide based on the brands/concentration amount in the bottle) and colouring. Do not put flavouring or colour in the tall shotglass or the fifth water glass. In a saucepan, stir together the water and sugar until dissolved. Let boil (until ~210F) then continue to boil for another minute (~225F). Remove from heat for a few minutes, then pour into the four water glasses with flavouring and colouring and the shotglass. IMPORTANT: You must let the water glasses with sugar water sit and cool until room temperature, otherwise the sugar won’t attach to the sticks. Angle the shotglass and dip wooden skewers into the sugar mixture to coat. Roll the wooden skewer in white sugar, and set aside to dry. Once dry, take one clean skewer, lay it across the top of the empty water glass that isn't being used for sugar. 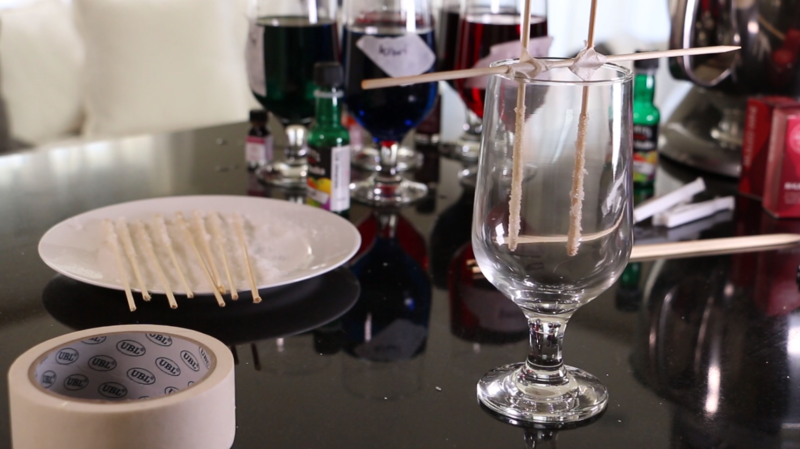 Take two sugared sticks and use some masking tape to attach them to the stick laying across the glass. Continue until there is one for each glass of sugar water. Making sure the sugar syrup is cooled, place a sugar stick into each glass with sugar water. Set aside where the glasses won't get knocked. Place a loosely woven cotton cloth over the glasses to keep dust out and let sit for at least a week while the sugar crystallises to the sticks. In a week, come back and remove the sticks from the glasses. Let dry on a plate of white sugar before serving. Additionally you could roll in citric acid for a sour effect. Make sure you follow the recipe closely. If the sugar water is too warm when you place the sticks in, this recipe won't work! Additionally, knocking or disrupting the glasses while they sit for a week can interrupt the sugar attaching to the sticks. You might also like these other Wonka recipes here on InLiterature.net! Thank you for a great recipe!!! My kids will be so happy to make it with me.